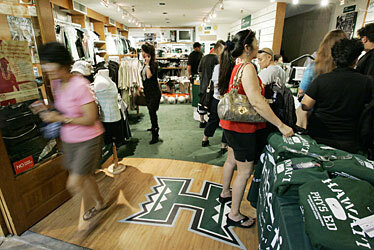 The Rainbowtique at Ward Centre was busy yesterday, a day after the University of Hawaii Warriors' win over Boise State. The whole state seems to be sharing in the University of Hawaii football team's championship victory Friday night. "You're going to see a little more pride with the state of Hawaii, and people will walk with a little more swagger now," Lt. Gov. James Aiona said yesterday. Pride translated into commerce as fans snapped up WAC championship T-shirts, hats and other UH merchandise. Lines ran out the door at the Rainbowtique store at Ward Centre. "I knew this was going to happen," said fan Mike Piccinino. "You win a WAC championship, everybody is going to get on the band wagon." But while Friday's win keeps the Warriors' dreams of a Bowl Championship Series game alive, the team still has to get past the Washington Huskies Saturday night for the regular season to be perfect. Fans lined up yesterday at the Rainbowtique at Ward Centre to purchase WAC championship shirts and other University of Hawaii merchandise. Halle Nguyen showed off a cap she bought yesterday from the store. Fans are savoring the thrill of victory after the University of Hawaii Warriors remained undefeated and won the Western Athletic Conference championship. 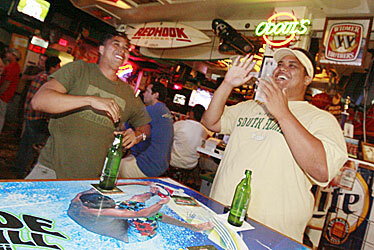 At the Eastside Bar and Grill sports bar yesterday, UH fans celebrated when Kansas lost to Missouri, making Hawaii the only undefeated team in the nation. But to remain undefeated, UH first must get past the Washington Huskies Saturday night. "I'd love UW to be the spoiler," said Jyron Salamanca, 33, of Kaimuki, a University of Washington alumnus. But after watching his team lose to rival Washington State yesterday, Salamanca isn't confident of the outcome. "It's going to be scary," he said. "I just got a text from my buddy. He's wondering how we're going to stop them." Salamanca already has tickets for Saturday's sold-out game. But those seeking to buy at the last minute may have to pay the price. On craigslist.com, buyers were asking from $100 to up to $1,000 -- for tickets in the south end zone. The Warriors' winning ways are boosting state pride and boosting business, said Eastside Grill owner Robbie Acoba. "It helped everybody," he said. "It helped the whole state business-wise, from merchandisers to the run-of-the-mill grill and bar." That was certainly true yesterday at the Rainbowtique at Ward Centre, where fans were lined up 10 deep to purchase WAC championship shirts and other green and white gear. "This is the busiest I've seen it," said sales associate Chris Agbalog. He couldn't say how many championship shirts were sold or how much business increased, but said the line started in the morning and kept growing. Paul Nakatani and James Bird clapped yesterday after watching Missouri score against Kansas on TV. The friends will watch the University of Washington play UH at Aloha Stadium on Saturday. "I just want to get a T-shirt that says 'WAC Championship,'" said Layne Matsushita, 50, who flew in from Hilo to attend the game. Thomas Santos of Royal Kunia said the line in the morning was about 50 or 60 people deep. He said he waited in line for about 20 minutes just to pay for three shirts. Santos returned again in the afternoon, after the store restocked, so he could purchase six more WAC championship shirts for his family. "For us it's pretty cool," said Santos, who said his family has been season-ticket holders for 25 years. "This is probably our first and our last year to get this far," said fan Paul Nakatani, who said he was dancing on the field after the game yesterday. "Everybody comes together now," Acoba said. "There's one goal. The whole state comes together as one team."